With its ultra-slim design and aluminum alloy base, the stylish E9100M is a real eye-catcher whether used on your desktop or on the go with a laptop. 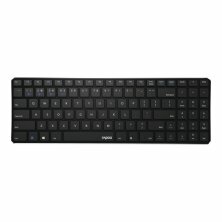 Despite its compact size, this keyboard offers full-size keys, which makes typing much more comfortable, especially with longer texts. E9100M is not only advanced in design but also in functionality. 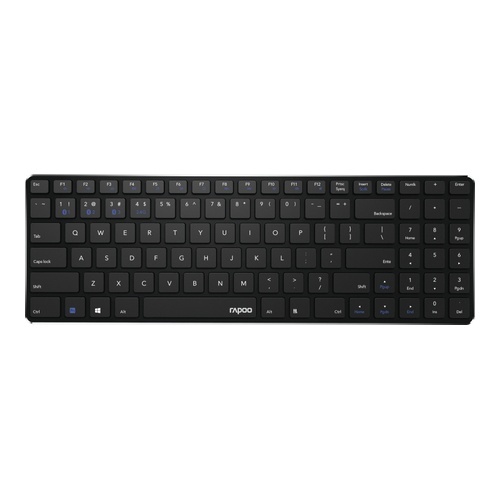 The keyboard features Rapoo’s multi-mode wireless connection- via reliable 2.4 GHz wireless transmission, Bluetooth 3.0 or Bluetooth 4.0 (Smart) - enabling you to connect simultaneously to multiple devices and change (pair automatically) among them. What’s more, Rapoo’s energy-saving technologies offer a battery life of up to 12 months, minimizing the need for replacing batteries.